In July of 1995, I began an assignment as a social worker for Catholic Social Services’ Refugee Resettlement Program in Mobile, Alabama. I was hired for the specific task of receiving and resettling Cuban refugees from the U.S. Naval Base at Guantánamo Bay in southeastern Cuba, where over 20,000 Cuban balseros (rafters) were still being held in indefinite detention. During the next nine months (July 1995 through March 1996), I worked with the Resettlement Program, personally helping to resettle over 125 Cubans. During this period, our agency resettled two distinct streams of Cuban immigrants: rafters who had been in detention in Guantánamo and former political prisoners who were arriving directly from Havana, usually accompanied by a number of immediate family members. 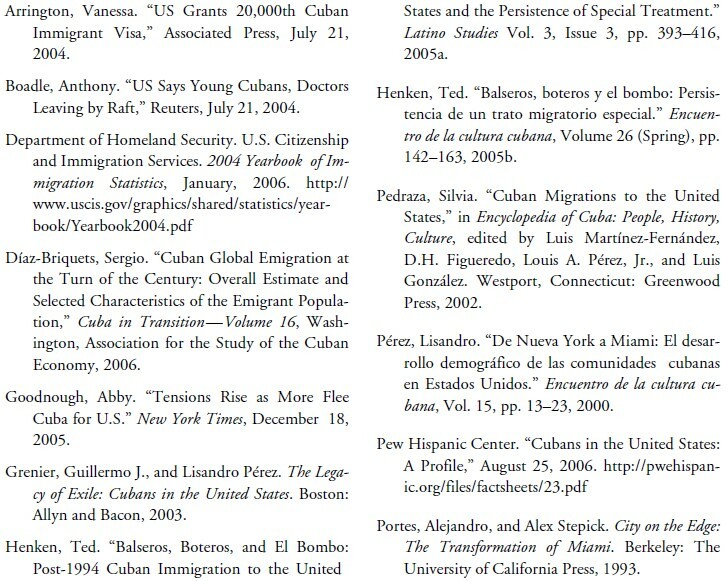 Building on the more analytical and documentary research I have already done on Cuban balsero migration (Henken 2005a; 2005b), this paper attempts to give a statistical update on the Cuban-American population and on Cuban immigration to the United States over the past decade (with a special focus on the last 2–3 years). At the same, I want to share some preliminary results of an ongoing research project that revisits the lives and experiences of a portion of the specific group of Cuban rafters whom I first met in 1995–1996 in Alabama during my work as a resettlement coordinator. Thus, the first part of the paper is a series of personal vignettes from my time working with Cuban rafters, highlighting their diversity of motivations and experiences as rafters. The second part of the paper is a descriptive and statistical overview and update on Cuban immigration to the U.S., with a focus on the bombero, balsero, and botero phenomenon as it developed after 1994. Three short anecdotes, garnered from my nine months working with this newest wave of Cuban refugees, highlight the complexity of their experiences as well as their diverse motivations for leaving Cuba and coming to the United States. Hesitant to bring up political matters with my new Cuban clients for fear of stirring up heated emotions or painful memories, I developed the habit of assuaging my curiosity about their motivations to migrate by playing the songs of two famous but very different Cuban musicians for them in my car while taking them to their various appointments: Cuban “protest” singer Silvio Rodríguez and Cuban-American crossover salsa sensation Gloria Estefan. Despite (or perhaps because of) Rodríguez’s semi-official persona, the great majority of my Cuban refugee clients reacted enthusiastically to his music, singing along with gusto and even asking me for copies of the tapes to play at home. There was at least one refugee family, however, who respectfully inquired whether I realized that the music I was playing for them was “communist.” On the other hand, few of them knew Estefan’s songs or had even heard her name before, though most enjoyed hearing her Cuban- derived rhythms and often poetic, always nostalgic Spanish lyrics about her (and their) “lost island.” A handful even commented approvingly on the concert Estefan had performed for them while they waited anxiously in detention at Guantánamo. Such starkly different reactions and opinions among such supposedly similar refugees highlight the great difficulty in uncovering a single “truth” about Cuban immigration from the subjective stories and experiences of any group of Cuban rafters. Similarly, the recent, provocative, Oscar-nominated documentary film Balseros (2002) presents a series of portraits of seven different Cuban rafters that is at odds with traditional notions of the “Cuban success story.” Indeed, the film reveals an internal complexity in the rafters’ lives (both in Cuba and after their arrival in the United States) that defies facile labels like “model minorities” or “refugees from communism,” on the one hand, and economically motivated “boat people” or “illegal aliens,” on the other. The truth of this was brought home to me in July of 2004 after having seen the Balseros film just prior to a trip to Miami where I was to participate in a retrospective conference appropriately titled, “The Balsero Crisis Ten Years Later: No Longer Adrift?” Before the conference, I went to pick up a friend at the Greyhound bus station in Miami. As I wandered around the bus station unable to locate my colleague, I spotted a strangely familiar face in the crowd: that of Rafael Cano. In one of the more tragic and evocative sequences in the film, we meet Rafael as he departs Cuba, leaving behind his mother and sister, follow him through the camps at Guantánamo Bay Naval Base, and arrive with him more than a year later at the humble Miami home of his photographer uncle. Later, after following Rafael to the Midwest where he has become employed in a factory, we discover that he has “disappeared” and learn of his Miami relatives’ attempts to track him down. Through the efforts of the producers and viewers of the melodramatic news program “Primer Impacto,” we finally find Rafael once again. However, this time around he seems to be more desperate and alone than ever. Crippled from being hit by a car, Rafael is now a born-again Evangelical preacher at a store-front San Antonio, Texas, Pentecostal church, though the film never reveals if in fact he is ever reunited with his family. With all these details racing through my mind, I approached Rafael by stating his name and asking him if he did not live in San Antonio, Texas. He stared at me blankly for a moment, finally answering in the affirmative, but that he had come to Miami, “to look for his family.” I quickly explained that I had seen him in the documentary, and after a long, confused pause, he responded that he did recall the filming of the documentary but that he had in fact never seen the finished film for himself. After a few more similar cryptic exchanges, it quickly became clear to me that Rafael had been waiting desperately in the bus station for more than a day hoping to locate his relatives and was indeed now truly “adrift,” with nowhere to go and no one to turn to. Before taking my leave, I explained to Rafael that I had no car and was myself only visiting Miami for the weekend. I gave him my contact number and cab fare to get to his relatives’ apartment, though it was clear that he needed more assistance than I was prepared to provide. I never heard from him again. The existence of a diasporic Cuban community in the United States dates back to the middle of the 19th century, when a succession of prominent political exiles like Father Félix Varela, filibusterer Narciso López, and patriot José Martí all came to live in the United States (most commonly to New York City) for extended periods between the 1840s and the 1890s. Likewise, the first half of the 20th century saw small but significant Cuban immigrant communities develop in Key West, Tampa (Ybor City), New Orleans, and New York (Pérez 2000). However, it was not until the revolution of 1959 that Cubans began to come to the United States in large numbers. Unlike the bulk of the Cuban immigrant generations that had preceded them, however, these newcomers saw their stay in America as only temporary. In a sense, reverting to the identity of their 19th century predecessors, these émigrés saw their sojourn in the United States as an emergency measure that would end only when the political crisis in their homeland also ended. In short, these new arrivals thought of themselves not as immigrants at all, but as exiles. Both sides in the ideological war between Cuba and the United States have attempted to manipulate the meanings and identities of post-1959 Cuban émigrés in line with their own narrow geopolitical interests. On the one hand, between the 1960s and 1980s, the Cuban government consistently sought to politicize emigration as a threat to the revolution and stigmatize emigrants as “traitors” (traidores) or “worms” (gusanos). However, in response to economic need, during the 1990s (and occasionally before then) the Cuban government began to alter its image of Cuban- Americans. Frequently referring to them now simply as members of the Cuban “community” abroad, the Castro regime seems to have realized that the traidores and gusanos of old can now be counted on to be the trae-dolares (dollar-bringers) and mariposas (butterflies) of today. U.S. federal, state, and local governments have a similarly schizophrenic, love-hate relationship with Cuban- Americans. Those who were initially given wide welcome as freedom loving “exiles,” “heroes” who voted with their feet, and “refugees from Communism,” have occasionally been portrayed as unsavory criminal elements and social charges, increasingly likely to be seen (and treated) as just another group of unwanted and unwelcome immigrants (notwithstanding the persistence of special treatment in some areas). Despite the early exiles’ expectation of an eventual return to their homeland, they remained in the United States and were joined by four successive waves of new arrivals, each of which would gradually alter the overall orientation and identity of the émigré community at large. Typically, these five waves of Cuban émigrés are grouped into cohorts based on time of exit/arrival and the general social characteristics they have in common (Pedraza 2002). First, there are the so-called “golden exiles,” who arrived between 1959 and 1961. Pedraza has characterized this group as “those who wait” in the sense that they were made up largely of Cuba’s pre-revolutionary elite who came to the United States awaiting regime change back home. After the revolution entered a new, more radical phase and was attacked by the United States at the Bay of Pigs in April 1961, there ensued a new phase of emigration characterized by “those who escape.” This cohort was more middle-class in social composition, included families, unaccompanied children, and others who resorted to escaping the island on boats and rafts when exit flights from Cuba were discontinued after the October 1962 missile crisis. By 1965, with the break with the United States hardened and the radical turn of the revolution firmly consolidated, emigration from Cuba took on a somewhat routine quality in that the United States and Cuba arranged for regularly-scheduled flights for those wanting to leave the country as a solution to a brief, chaotic boatlift from the port of Camarioca in that year. Pedraza has labeled this cohort “those who search” (2002) in the sense that it was neither easy nor automatic to get permission to leave the country on these so-called “freedom flights.” Still, by 1973, more than 250,000 Cubans had arrived in the United States via the airlift. Like in the years between 1962 and 1965, after 1973 exit routes to potential emigrants were few. This changed drastically when a spontaneous occupation of the Peruvian embassy in April 1980 led Carter and Castro to engage in a dangerous game of rhetorical one-upsmanship, resulting in the historic exodus of more than 125,000 refugees through the port of Mariel during a six-month period that summer. Given that these Marielitos were largely young, single males of working-class origins (veritable children of the revolution with a more marked Afro-Cuban component than ever before), Pedraza has labeled them “those who hope” (2002). Also, the fact that they were byand- large formed by the revolution, their social composition and mix of motivations began to more closely reflect that of traditional immigrants rather than that of their exile forbearers. The final cohort (or cohorts) of Cuban émigrés are those who have come to the United States during the economic crisis that began in the late-1980s, officially labeled the “special period” by President Castro in 1990. Because these Cubans began leaving in increasing numbers on makeshift rafts due to the socioeconomic upheaval that resulted from the collapse of the Soviet Union, they have been characterized as “those who despair” (Pedraza 2002). However, while desperation may be an apt term to capture the complex and contradictory motivations of this cohort, Cuban immigration since 1990 has actually been composed of a number of different, complementary streams. As I will describe in greater detail below, while the late-1980s and early-1990s saw upwards of 30,000– 40,000 Cuban balseros arrive in the United States, after the 1994–1995 migration accords, this stream split in two different directions. First, over the past 10–12 years, more than 250,000 Cubans have benefited from the guaranteed minimum yearly quota of 20,000 immigrant visas (the bulk of which are granted through a visa lottery process known in Cuba as el bombo), as stipulated by the accords. Second, unable to “win” one of these much sought-after visas, a consistently high number of Cubans has resorted again to taking to the high seas as a means of exit.1 However, they have largely abandoned the dangerous and unreliable method of coming as balseros and instead have opted for the more reliable method of emigrating on speedboats (as boteros). With the aid of networks of professional migrant smugglers, these newest immigrants take conscious advantage of the infamous loophole in U.S. immigration law that interdicts and repatriates most Cubans caught at sea (wet-foot), while granting legal status to those who successfully make it to American shores (dry-foot) (Henken 2005a; 2005b). All told, the 2000 Census enumerated 1,241,685 Cubans living in the United States. Seventy-three percent (906,430) of this total were immigrants (that is, CBAs, Cuban-born Americans), while the other 27% (335,255) made up the growing Cuban second generation (ABCs, American-born Cubans) (Pedraza 2002).2 However, the addition of at least 20,000 new immigrants directly from Cuba each year has had the effect of constantly replenishing the Cuban-born portion of the Cuban-American population. These two growing demographic elements—the gradual increase in the size of the American-born second generation (ABCs) and the steady arrival of new Cuban immigrants (CBAs)—competes with the demographic (as well as economic and political) strength of the pre-1980 exiles in determining the overall orientation and identity of the Cuban émigré community (Pérez 2000). Some outlines of these changes are evident in an August, 2006, publication from the Pew Hispanic Center based on the Census Bureau’s 2004 American Community Survey (ACS). According to that report, by 2004 the Cuban population of the United States had reached 1,448,684. Though still predominant, the Cuban-born portion of this total had dropped to 63% (or 912,686 persons), while the U.S.-born portion had risen to 37% (or 535,998 persons). Further disaggregating the Cuban-born group shows a clear growth in the segment of the Cuban-born U.S. population to have arrived after 1980 and 1990, respectively. Of the roughly 913,000 foreign-born Cubans in the U.S., 30% (431,429) arrived prior to 1980, while 12% (171,798) came between 1980 and 1990, with another 21% (309,459) arriving since 1990. Thus, while exile identity (and politics) have predominated among the Cuban-American community historically, a new immigrant identity (and politics, or non-politics) has more recently emerged. Indicative of this is the fact that while 28% of Cubans say they consider themselves Republicans (a considerably higher percentage than for other Hispanics), another 20% are Democrats, with 27% considering themselves Independents (Pew Hispanic Center 2006). Thus, are Cubans in America still exiles, and not immigrants? Like with Castro’s own legendary longevity in Havana, the exile identity is subject to “the biological solution” (death from old age). But it is also challenged by changes in the demographic profile and political orientation of the Cuban-American community, as well as by modifications within the socialist regime in Cuba and larger changes in the global political context since the end of the Cold War. One oft-cited irony of the historic Cuban exile community is that though they never came with the intention to stay, they have enjoyed unequalled success among Latinos at what they say they are not (immigrants) and continued failure at what they say they are (exiles). In the end, an exile only succeeds if and when he or she can go home again (Grenier and Pérez 2003). A final, more sociological point about the Cuban presence in the United States bears mentioning. Unlike virtually every other immigrant group, Cubans have tended to more densely concentrate in South Florida over time rather than disperse across the region or nation. More than 45 years after major immigration flows from Cuba began, over two-thirds (68%) of Cubans live in Florida (986,000), with the vast majority residing in the Miami-Dade metro area (Pew Hispanic Center 2006). The continued arrival of a large group of new immigrants since 1995 has only strengthened this tendency, which may continue as long as Cuba’s socialist system survives (with or without Fidel Castro). Whether this makes Cuban- Americans an historical anomaly or the crest of the wave of the future of American immigration remains to be seen. Samuel P. Huntington’s recent book Who Are We? (2004), makes a strong if overly alarmist argument concluding (and fearing) the latter course. Cubans in Miami have already rewritten another standard rule of assimilation and success in American life. Instead of assimilating into the mainstream in order to succeed, they have largely redefined the mainstream by taking it over (in South Florida) and forcing others to acculturate to Cuban (-American) culture to succeed in their midst (Portes and Stepick 1993). Thus, if it is true that Cubans’ tremendous socioeconomic and political success in the United States has been based not on assimilation, but predicated on the preservation of their ethnic social networks and a distinct ethnic identity, one wonders whether this formula can or should be replicated by other immigrant/ ethnic groups in order to achieve similar levels of success. During the late-1980s and early-1990s the U.S. Coast Guard noted a marked increase in the numbers of Cuban balseros it was discovering at sea en route to the United States. Numbers grew from just 391 in 1989, to 2,203 in 1991, reaching 3,656 in 1993. Then, as the economic crisis on the island began to worsen and the United States continued its policy of giving few immigrant visas to Cubans on the island while allowing virtually free entry to all arrivals from Cuba, the number of rafters exploded reaching 4,731 in just the first seven months of 1994. The United States’ willingness to accept all newcomers and the increasingly explosive atmosphere in Havana led a frustrated Castro to call Washington’s bluff after embassy occupations and dramatic boat hijackings culminated in an anti-government riot in Havana on August 5, 1994. Castro instructed the Cuban Coast Guard to cease interfering with “illegal” departures from the island, allowing thousands more rafters to flee. More than 20,000 were picked up at sea in the month of August alone. As a result, the Clinton administration reversed longstanding U.S. policy by announcing that any Cuban rafter picked up in the future would not be allowed to enter the United States but would be indefinitely detained at a “safe haven” at Guantánamo. Later, in a September accord with the Cuban Government, the Clinton administration agreed to persuade detainees at Guantánamo to return to Cuba and apply to immigrate through official channels, while the Cuban Government would once again stop unauthorized Cubans from leaving by raft. The terms of this agreement also stipulated that the United States would henceforth grant a minimum of 20,000 immigrant visas to Cubans each year. While this agreement ended the outpouring of rafters from Cuba, it was not until May, 1995, after a series of secret meetings with the Cuban Government, that the United States announced that all Cuban rafters still held at Guantánamo would gradually be paroled into the United States. This decision led directly to the activation of a vast network of refugee resettlement centers throughout the United States to aid in the processing of these newcomers. My own position at Catholic Social Services in Mobile, Alabama, was created just two months later in order to begin receiving a small portion of the estimated 20,000 Guantánamo rafters. At the same time that the May 1995 accord opened the doors of America to these Cubans, it also made clear that all future Cuban emigrants intercepted at sea would be returned to Cuba. Confirming this shift in policy, the first repatriations took place towards the end of May, while Guantánamo was gradually emptied of Cubans with all but 1,000 of the original 32,000 rafters resettled in the United States by March 1996. This new policy inadvertently provoked an increase in immigrant smuggling in the Caribbean under what has come to be known as the infamous “wet-foot, dry-foot” policy, since the 1966 Cuban Adjustment Act still gives legal status to any Cuban actually making it to dry U.S. land. Legal Cuban immigrants can be divided into three groups. The first and smallest group are the 2,000 to 3,000 yearly beneficiaries of the U.S. Interests Section’s special in-country refugee program and their family members. The second group are the direct relatives of U.S. citizens or legal residents who are issued visas each year based on the family reunification criteria of American immigration law. The third, and by far largest, group are the winners of the Cuban visa lottery and their family members. Officially called the Special Cuban Migration Program (SCMP), this lottery is known in Cuba as el bombo and was set up as a result of the September, 1994 U.S.-Cuba Migration Talks. Though the U.S. Interests Section (USIS) issued only 11,222 immigrant visas between 1985 and 1994 (Masud-Piloto 1996), James Cason, chief of the USIS in Havana from 2002–2004, has put the total number of Cubans issued U.S. immigrant visas since the 1994–1995 accords at 250,000 (Arrington 2004; Boadle 2004). Furthermore, according to the 2004 Yearbook of Immigration Statistics, between 1995 and 2004, a total of 216,095 Cubans were legally admitted to the United States (Table 1). 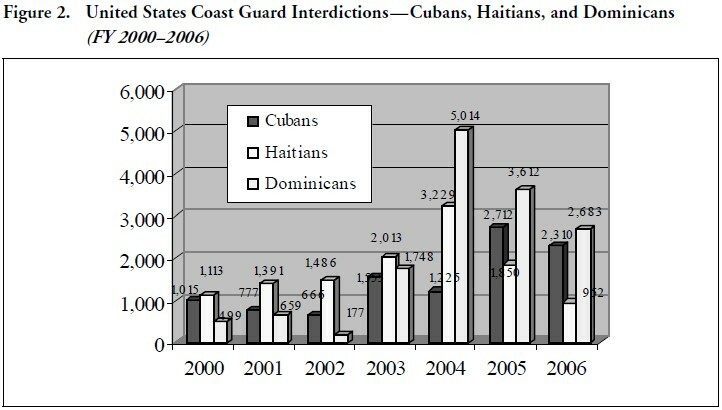 Thus, although the persistence of Cuban sea exits has attracted sustained media attention in the ten years since the 1994 crisis, an arguably much more significant result of the 1995 migration accords is the fact that the number of legal Cuban immigrants admitted to the U.S. (more than 200,000) has dwarfed the 10,000 who have managed to arrive by sea. Moreover, Cuba has sent roughly 20 times more legal immigrants between 1995 and 2004 than it did in the preceding decade. In fact, Cuba’s yearly total of legal immigrants in each of the past ten years has placed it among the top ten sending nations to the United States each year. Therefore, when discussing unauthorized Cuban immigration, we would do well to keep in mind that Cuba currently enjoys an extremely generous policy of legal immigration and that the major Cuban immigration flow since 1995 has been an orderly, safe, and legal one. Furthermore, though the current migration debate is often framed around the question of why so many Cubans are coming by unauthorized means, a better question may be why so few have chosen to take to the seas given the facts that they enjoy significant legal exceptions upon arrival and that the demand for legal immigrant visas in Cuba continues to far outstrip the admittedly generous supply. Tables 2 and 3 are drawn from my previously published work on Cuban balsero migration (Henken 2005a; 2005b). They are shown here in order to indicate, first, a general growth both in the number of land apprehensions (Table 2) and sea interdictions (Table 3) between 1995 and 2004. During that same period, there was an almost complete disappearance of Cubans attempting to escape capture once making landfall (Table 2). Finally, the overall number of arrivals (Table 3, which is a simple combination of the totals from Table 2 above) gradually increases, while (sea) interdictions decrease (except for 2003 and 2004). The numbers up to 2003 clearly indicate a shift from a balsero to a botero strategy and a concomitant increase in the use of migrant smuggling after 1997–1998. As yet unknown due to incomplete data, is how this trend has developed after 2004. I have added below the complete 2004 fiscal year Cuban interdictions (Table 4), placing them alongside the corresponding numbers for Haiti and the Dominican Republic for comparison. I have also done this for 2005 and 2006 up to July 13, 2006. Though inconclusive due to the lack of numbers of arrivals for all three groups,4 these numbers do indicate that migrant smuggling in the Caribbean continues apace. In fact, the number of Cuban interdictions has been higher in 2005 (3,712) and 2006 (2,310) than at any time since the 1994 balsero crisis (see Table 4 and Figures 1 and 2) (Goodnough 2005). Still, a quick comparison with Haiti and the Dominican Republic shows that Cubans are neither the only nor the most common migrant group to resort to unlawful maritime migration, though they remain the only group to receive legal status if they reach shore. 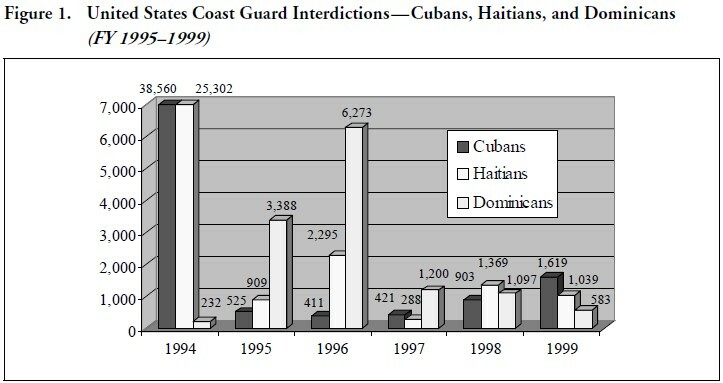 Finally, Figures 1 and 2 below are a graphic comparison of U.S. Coast Guard interdictions of these three nationalities in the 13 years since 1994. Since the Cuban/Haitian balsero crisis was temporarily resolved between 1994 and 1995, Dominicans have been the clear leaders especially during the mid-1990s and again since 2004 (26,933). The numbers of Haitians interdicted (17,934) has been more comparable to the number of Cubans (14,139) interdicted over these years. Of the three national groups, Cubans remain the least commonly interdicted, though the Cuban totals have been consistently strong since 2003, as indicated above. This paper traces a number of trends that have developed in Cuban immigration to the United States since 1990. First, there has been a resurgence in new Cuban immigration since 1990 due in part to the onset of a major economic crisis on the island. The balsero crisis that developed between 1990 and 1994 came to a head in the summer of 1994, finally resolved between September 1994 and May 1995. After two meetings between U.S. and Cuban government representatives, the United States decided to substantially change its immigration policy toward Cuba. First, it granted a minimum of 20,000 immigrant visas each year, a policy change that has resulted in more than 250,000 new Cuban immigrants to the United States over the past 10–12 years. This new influx has replenished the Cuban-born portion of the Cuban-American population, while at the same time increasing the numerical strength of the post-1980, and especially post-1990, portion of that population. This change will have implications in the traditionally dominant exile identity of the Cuban-American population. Second, it ceased the practice of allowing all Cubans interdicted at sea to enter the United States. Instead, Cuban maritime migrants are routinely returned to Cuba when intercepted at sea, unless they can demonstrate a well-founded claim as refugees. However, the United States has still not brought its practice of granting legal residence to any Cuban who manages to make it to American shores in line with this new policy of repatriation. This remaining loophole, often referred to as the “wet-foot, dry-foot” policy and based on the 1966 Cuban Adjustment Act, has led potential migrants to eschew perilous journeys on rafts opting instead for coming on speedboats operated by highly organized migrant smuggling rings. Still, despite this trend among Cubans (especially pronounced in the past two years), U.S. Coast Guard statistics indicate that Haitian and especially Dominican rafters/boaters have easily outnumbered Cubans in the 10–12 years since 1995. 1. The total annual number of Cuban rafters would include the sum of four mutually exclusive streams: (1) Coast Guard interdictions; (2) interdictions ashore by other U.S. agencies; (3) migrants interdicted by foreign law enforcement units; and (4) those observed by U.S. agents who evade capture. Since 1995 this annual number has fluctuated between 411 and 4,181, averaging just under 2,000. See Henken (2005a: 405) for more details. 2. Note that Díaz-Briquets’ numbers (2006) are slightly different. He has 1,248,064 as the total U.S. Cuban population in 2000 with 31.6% (394,837) being American-born and the other 68.4% (853,227) immigrants. 3. Due to an on-going dispute between the Cuban government and the U.S. Interests Section, no new general lottery has been held since 1998. The pool of names from that year continues to be the source of all new winners of the on-going visa lottery, creating problems for potential new applicants—especially those under 26 years of age since they were not eligible to submit an application in 1998 when they were under 18. 4. Newspaper reports indicate that during fiscal year 2005, a total of 2,530 Cubans arrived in South Florida by irregular maritime means, while 954 arrived in 2004 (Goodnough 2005).